5. Hydrostatic transmissions come standard. 3. Spend less time mowing your lawn. 2. Macho styling is sure to turn heads in the neighborhood. 1. Nothing turns less than zero. Features available: Rear or side bagging. ZTR lawn mowers represent the ultimate in a mowing machine. There is not a more advanced mower on the planet than a ZTR mower! What makes a ZTR so cool? Unequaled turning radius, for starters. The rear wheels deliver the power to the mower, just like in a lawn tractor. The difference a ZTR lawn mower provides is this: the rear wheels are able to rotate forwards or backwards independently of each other. Each wheel is controlled by a lever which is in easy reach of the operator. Push the lever forwards, the wheel rotates forward. Push the lever farther, and the wheel turns faster. Bring the lever back to the starting position, and the drive wheel comes to a gentle stop. Pull the lever backwards, and the drive wheel goes into reverse. Since each wheel has a control lever that works independently, both levers need to be pushed forwards at the same time for the mower to move. If one lever is pushed forwards while the other is pulled backwards, a perfect zero radius turn is performed - thus the name ‘ZTR. The ZTR lawn mowers mow more quickly than other mower designs since they sport a combination of faster ground speeds, wider cutting decks, and more powerful engines. The time savings when mowing an area greater than 2 acres is substantial and impressive. This is why commercial versions of these machines are found in many parks and golf courses. These mowers have a rear mounted engine, with the cutting deck in front. This allows for an unobstructed view of the lawn ahead - no engine cover to peer over, like with a riding tractor. The cutting deck is supported by large wheels that turn freely in any direction, much like the front wheels on a shopping cart. This is because the rear wheels supply the power and direction. There is no steering wheel or complicated linkages to the front wheels needed. ZTR lawn mowers usually have 4 stroke engines ( sometimes known as 4 cycle engines) or diesel engines (on the commercial models). Alternative fuel mowers are starting to appear, also. The best mowers are equipped with engined that feature a pressurized oil system. This allows for the oil to be filtered ( like it is in your car). The oil filter may be changed with the oil, which will help to extend the engine life. Most engines will have the overhead valve ( OHV) design, which provides more power, better fuel economy, and more efficient cooling. The less expensive machines come equipped with a single cylinder engine, which typically delivers less horsepower and torque than a twin cylinder engine. If your budget can afford it, you should strongly consider the twin cylinder design. The transmission is what transfers the power from the engine to the rear wheels. As discussed above, all modern ZTR lawn mowers feature a hydrostatic transmission of some kind. The less expensive models come equipped with a Hydro-Gear transmission, which is a combination of a hydraulic pump and motor attached to a gear box differential. This comes as a single unit, with an axle on either side of the gear box to power the rear wheels. The best ZTR lawn mowers use a separate pump and hydraulic motor assembly on each of the rear wheels, eliminating the gears and differential completely. This is a superior way of bringing the engine power to the wheels, but is also much more expensive. A larger engine is also needed, since the power requirements are higher. As with any hydrostatic transmission, there are an infinite number of possible gear ratios and speeds, from stop to maximum speed. Going in reverse is also a snap - just pull one or both of the control levers backwards. These mowers have a rear mounted engine, with the cutting deck in front. This allows for an unobstructed view of the lawn ahead - no engine cover to peer over. The cutting deck is supported by large wheels that turn freely in any direction, much like the front wheels on a shopping cart. This is because the rear wheels supply the power and direction. There is no steering wheel or complicated linkages to the front wheels, like a lawn tractor has. Most ZTR manufacturers offer a rear bagging or side collection system as an option. All of these mowers have at least 2 cutting blades under the deck for added efficiency that supports the increased ground speed. Setting the deck height is accomplished by a foot assisted lever. Some models use the hydraulics from the transmission to make the deck height adjustment purely mechanical ( and effortless). The blade spindle allows the transfer of the engine power to the cutting blade. The spindle is a shaft supported by ball bearings. The top of the spindle shaft has a pulley for the fan belt to ride in, and the bottom of the shaft is where the cutting blade connects. Over time the bearings will wear out, so the spindle assembly is made to be removed from the cutting deck when needed. Some ZTR lawn mowers allow the spindles to be lubricated with grease, and others use sealed bearings. The best spindles are made of cast iron. Zero Turn Radius says it all. Power Take Off (PTO) is a fancy name for the method used to bring the engine power to the cutting blades. The PTO can be engaged or disengaged as needed. The less expensive mowers use a lever that must be moved to manually get the job done. The lever tightens a fan belt that is connected to the cutting blade (or attachment). The more expensive models use an electric clutch that is engaged with the flick of a switch. Hey, a ZTR is made to do one thing - cut grass! This makes for few available attachments. Bet on rear bagging systems to be available on the vast majority of machines. 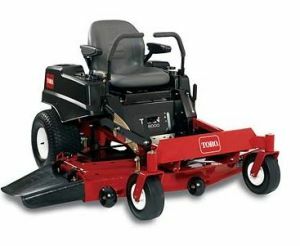 Now that the basics of ZTR lawn mower design have been covered, it is time to find the best ZTR for your needs and budget. The great thing about these machines is you would have a difficult time to find a brand that is not well built. It seems that all the machines reviewed are at least very good. Some, with more commercial features, are downright great.